If you thought sitting on your couch this weekend was an option, then you thought wrong. What’s not to love about Coachella Valley weather during the month of January? If your not doing the Bump n Grind (a famous hiking trail in the desert, for those unfamiliar), or your not training for the Tour de Palm Springs, or your not at Ace Hotel soaking up rays and sipping on a Sweet Tea Vodka…. then, your probably on a mind trip, mentally traveling the world through one of the Palm Springs International Film Festival flicks. And if you’re not doing any of the above, then I still hope it’s something productive, something outside, and something cool. Whatever you do this weekend, here are a list of “somethings” to do afterwards. A treat for all the locals. If you haven’t already heard, Shoot the Hero’s director is from the desert. The film is screening at the Film Festival this week/end and they are almost all sold out. This Friday at Space 120 is the official AFTER PARTY to the film, and who else, besides DJ ALF ALPHA to rock the party. 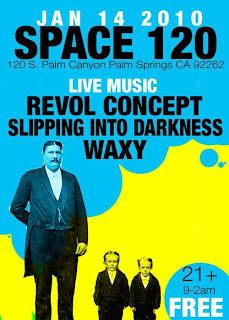 Space 120 is going to be a packed house. And it’s going to be free. Personally, I like this flyer because they did it on Photobucket. And I’m down with that. 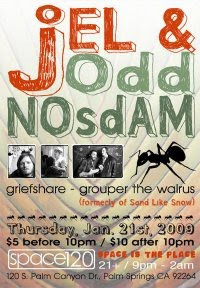 I do a lot of my flyers on Photobucket. And if you do Graphic Design work on Photobucket, then you’re a friend of mine. This party right here wins the award for ** SHOW OF THE WEEK**. That’s a new category I just made up right now. But I think this a good reason to start that trend. Oh, you forgot the GZA was in a dope film?!? Didn’t you. Anyways, it’s going to be a packed house at Space 120 on Saturday night. Presales are being sold at Epidemic Skate Shop (Cathedral City), Fresh Out the Box (Palm Desert), and Revolution Ride Shop (La Quinta). However, you can purchase your tickets at the door. Don’t forget to bring that Ca$h. And, know that you have to be 21+ to enter. Come a little early to support your local hip hop homies, Precise, Flow Ethics, Smoke & Osirus. Nobody at this party is going to have an MPC. Just kidding. that GZA Flier doesnt say where the shows at! Plus no website? Space 120 needs a new marketing/pr person.